There’s something wonderfully nostalgic about sweet peas and their use in vintage-themed wedding flowers has meant this unassuming, delicate blossom has become fashionable once again. Whether displayed in clusters tied together with ribbon, or handfuls of frilly petals sprinkled amongst glasses as you dine al fresco, sweet peas are one of life’s little luxuries and notoriously difficult to buy. Despite flowering abundantly during summer, sweet peas are expensive to import and short lived once picked, so have a noted absence from florists’ buckets and bouquets. Despite their scarcity in the shops, sweet peas are simple to grow and flower prolifically, meaning you can fill your home and garden with their intoxicating scent throughout the summer. because the Sweet Pea is a vegetable that just happens to grow the most lovely summer flowers. I could talk for a long time about Sweet Peas, and the way my father eats the peas straight out of the pod when he is feeling peckish at the allotment, but this post is in ode to the flower that grows from the vegetable vine and it’s re-emergence into the wedding scene. 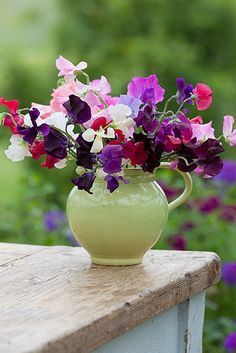 Growing up there was always a vase of Sweet Peas of assorted colours in the house. Dad would pick them and bring them home as an easy floral display that just kept on giving, believe it or not even once the flowers had “died” they still looked good. As sweet peas are delicate frilly blooms with a wonderful natural scent, they look lovely on their own or mixed with other flowers such as roses, baby’s breath or stems of lavender to create beautiful bouquets, button holes or floral table centrepieces. If you’re not fussy about the colour of your flowers and you are getting married between February and July then why not create your own bridal posy out of the flowers from your own or a friend/relatives allotment/garden? A simple hand tied sweet pea posy would be perfect for flower girls or younger BMs. If you’re having a relaxed, homey vibe to your nuptials why not use sweet peas with heritage style roses in jam jars (mason jars) for your centrepieces? Sweet peas mixed with candles create the most wonderful feminine, romantic vibe, plus they will provide your wedding day with a scent that is familiar to many and loved by all who know the smell. Here are some links to video tutorials on arranging Sweet Pea flowers. Are you considering using a vintage favourite for your wedding floral displays? Had you considered using Sweet Peas before? They can be expensive when bought due to the fact they don’t have a long shelf life after being picked and because most Sweet Peas from florists are imported, but for the budget bride, using Sweet Peas from your garden couldn’t be a better way to save without compromise.